Once upon a time on 21 April 2014, something extraordinary happened. Little Burnley gained promotion to the Premier League, providing the most improbable end to one of the season’s most magical and unpredictable stories. Pre-season, this small town Lancashire club had been a relegation favourite, with its tiny budget, threadbare squad and little-known manager. But as the season progressed it became increasingly clear that something remarkable was under way at this unfashionable club. ‘Fairytales’ tells the story of the season and gives a valuable insight into how a sporting David can overcome financial restrictions to compete with the Goliaths. 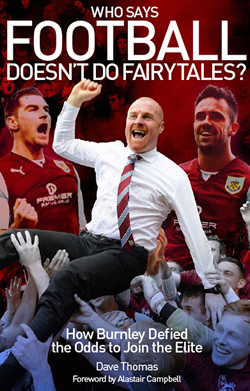 With many insights into the mindset of manager Sean Dyche and how he instilled that into his players, this book is more than just facts and figures and statistics of goals and corners, but gives a picture of relentless positivity, prodigious work rates, and no little skill. A small town could not believe what was happening. But by the end of the season the improbable had happened and the gates to the richest league in the world were open. These were players that accumulated some astonishing personal bests to the wide-eyed amazement of not just the town, but the football world.